Longtime jazz pianist David Benoit has worked with numerous vocalists and instrumentalists over the years, but his albums have tended to be primarily solo affairs with guests on only a few tracks. 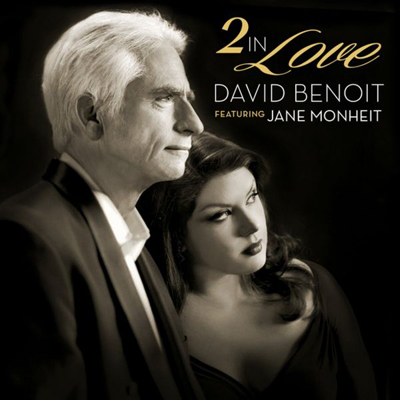 This one’s an exception: a true collaboration that blends Benoit’s diverse keyboard work with the sultry tones of swing-hued chanteuse Jane Monheit. The result is thoroughly engaging: a warm give-and-take between two pros who obviously had a lot of fun recording these 10 tracks. The mid-tempo “Too in Love” finds Monheit in a similarly saucy samba vibe, with the tune’s romantic lyrics again nicely augmented by Lauren Kosty’s percussive backdrop and Benoit’s driving piano chops. Most of the remaining tunes are slower, gentler ballads such as “Fly Away,” which builds to melodramatic crescendos that allow Monheit (in her own words) to “wail ... [on] a style of music that I don’t often get to sing.” A quiet piano prologue from Benoit opens the sweet, waltz-timed “Dragonfly,” which blends backing piano with violin (Michelle Suh) and cello (Cathy Biagini); the latter two also add pleasing touches to the haunting, melancholy “Something’s Gotta Give,” originally written by Benoit and lyricist Mark Winkler for the stage musical Don’t Count Me Out, a depiction of the final weeks of the doomed Marilyn Monroe’s life. Benoit released an earlier version of that latter tune on his 2005 album Orchestral Stories; he similarly “freshens up” another of his tunes — the much older “Life Is Like a Samba,” from his 1977 album Heavier Than Yesterday — and, re-christened with a new title (“Love in Hyde Park”), turns it into a delightful instrumental. The album concludes with a second instrumental: Benoit’s soulful solo piano fusion of Leonard Bernstein’s love theme from Candide and Stephen Sondheim’s “Send in the Clowns,” from A Little Night Music. Aside from the individuals already mentioned, the album’s drumming chores are divided between Clayton Cameron and Jamey Tate, while John Clayton and Davis Hughes trade off on bass. At not quite 40 minutes, 2 in Love is short but definitely sweet: a nice interlude for late-night snuggling. Quite a lot of time has passed since a new swinging female vocalist has impressed me; even more time since that same vocalist turned out to be a swinging bassist. Oh, yes: She’s also a composer. 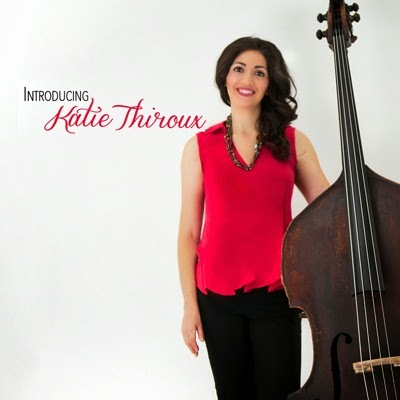 Meet Katie Thiroux, in her debut album. She was only 4 years old when she began to play the violin, and then she switched to the bass at 8. Four years later, a Lionel Hampton album turned her on to jazz, at which point she became a student of vocalist Tierney Sutton. Shortly after that, Thiroux began a mentorship with bassist John Clayton, was chosen as a “Shelley Manne New Talent,” and received the Phil Ramone Presidential Scholarship to the Berklee College of Music. She then taught at the latter’s International School, in Ecuador. Thiroux returned to Los Angeles and earned a master’s degree in jazz bass at Cal State Long Beach. She formed her own quartet in 2013, with guitarist Graham Dechter, saxophonist Roger Neumann and drummer Matt Witek. That combo is featured on this album, which was produced by Jeff Hamilton, a master musician in his own right. Finally, Frank Foster’s “Shiny Stockings” provides an excellent opportunity to compare Thiroux to Ella Fitzgerald; both versions swing quite nicely. Thiroux is a very talented young woman, and we’ll be hearing a lot more from her. I knew this release would be great, even before hearing it. Jeff Hamilton is the most tasteful drummer around; ditto for pianist Tamir Hendleman and bassist Christoph Luty. Add the fact that these artists have played together for more than a decade, and, well, you have a sure winner. Capri Records obviously thinks the same. They took this album — initially released in 2013 in Japan, by Art Promotion Inc. — and produced a 2,500-copy limited edition of their own. Get yours quickly (although I expect it’ll be popular enough to prompt further editions). Hamilton, born in the early 1950s, quickly became a percussion legend. It’s difficult to find a top artist with whom he hasn’t worked. 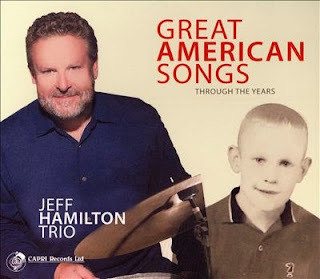 During his early years, the list included Lionel Hamilton, Woody Herman, Monty Alexander and the Tommy Dorsey “ghost band.” The Clayton-Hamilton Jazz Orchestra (CHJO) was formed in 1985, and still exists and records today. Other associations include Count Basie, Ella Fitzgerald, Rosemary Clooney, Diana Krall and combos under Hamilton’s own name. The number of vocalists he has supported is a further indication of his tasteful playing. Hendelmen, born in Israel in 1984, moved to the States and at age 14 won a Yamaha competition. In 1993, he became the youngest musical director at Florida’s Lovewell Institute. He has recorded with Barbra Streisand and Natalie Cole, toured with Tierney Sutton and the Bill Holman Big Band, and (of course) is a member of Hamilton’s combo and the CHJO. Luty has been with Hamilton’s trio for a decade, also is a member of the CHJO, and teaches. His association with name artists includes Shirley Horn, Dave Brubeck, Bill Cunliffe and Bill Watrous. Anyone who lived through the Big Band years will be familiar with the 10 Great American Songbook tunes that fill this album. It’s all familiar, memorable and swinging, and it’s an absolute must for your jazz library.